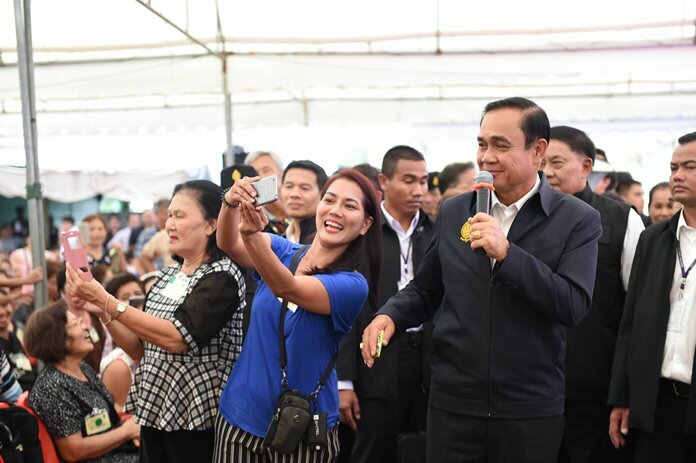 Bangkok – Prime Minister Gen Prayut Chan-o-cha visited various communities in Bangkok on Wednesday, to oversee the implementation of government policies. Gen Prayut made his first stop at Lam Or Tan Canal in Lat Krabang district to follow up on the area’s aquatic plant management project, which has adopted biological methods to make use of water hyacinth as well as prevent it from expanding in waterways. The prime minister then traveled to Kriang Krai Market to meet local people whom he asked to be patient, saying his administration’s development policies will eventually come to fruition as stability and prosperity take time to attain while assuring all sides that his visit this week was not to garner support from Thai voters ahead of the election. His next stop was Nong Chok Market. There, he explained to social welfare cardholders that although the 300-baht cash handout doesn’t cover all monthly expenses, the government is determined to help ease the adversities of the poor and low-income earners. Gen Prayut then traveled to Wat Mai Charoen Rat School in Nong Chok district to take part in traditional Thai games and watch traditional dances performed by Wat Mai Charoen Rat School students. The prime minister made his last stop at a new agricultural theory learning center where he joined 25 farmers in a traditional rice harvest practice. He asked the producers to follow safe and organic methods in their farming.